What They Say.....International bestseller Jill Mansell weaves a heartwarming tale of love, family and friendship in her latest novel. What I Say....Jill Mansell's books are the perfect way to spend an afternoon - they are also perfect poolside reading - just enough story to keep you interested but a light, fluffy read that keeps you entertained and feeling happy. This story had it all - bickering sisters, chance meetings with your one true love, an adoption story, a coming to terms with your real self story, and a suspected appendicitis that turns out to be an unexpected baby! I saw all of it coming except the baby. 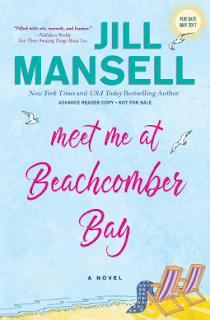 Grab a towel, a bottle of water, get in your pool float and crack open Mansell's latest and prepare to completely enjoy your day.